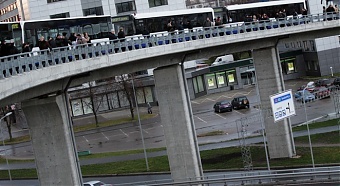 The newly built Southern Bridge in Riga will be ceremoniously unveiled today. Since the restoration of independence, the Southern Bridge has been the biggest and most complicated construction project in the country. The bridge will be unveiled to pedestrians at 6:00 p.m., but will be unveiled to automobile traffic a bit before midnight. In honor of the bridge's unveiling and Latvia's 90th anniversary of independence, today and tomorrow, the bridge will be specially lit.